The average person will be exposed to 2000 ads a day, 14,000 ads a week, and 728,000 ads a year. Unless you own a very unique business with a very niche market, it is likely that 5-10% of these ads are for your competitors products or services. With that kind of constant exposure it is no wonder consumers have learned to tune out most advertisements and publications. So how on earth can your business cut through the noise and clutter of all those other businesses and actually be noticed by anyone? What can you do with those advertising dollars to actually create a connection with your target customer? However big or small your budget, if there is a will there is a way to create effective advertising. We're talking about Location. If we are perfectly honest, no one really looks at billboards or magazine ads or bus stop ads anymore. If you want to create a meaningful connection with potential customers, then you need to start thinking out of the ordinary. If something is unexpected or out of the ordinary, it will get noticed. Our advice? Take regular, mundane locations and incorporate it someway into your message. The novelty of it will spark interest and your audience will stop and take notice. The more people stop and take notice, the better. Crowds attract crowds and people share what interests them. How do you use ads in these locations? We suggest something with bright colour reproduction, a durable material and adhesive backing which will allow it to stick with minimal physical effort on your part. Stickers and large format decals perhaps? 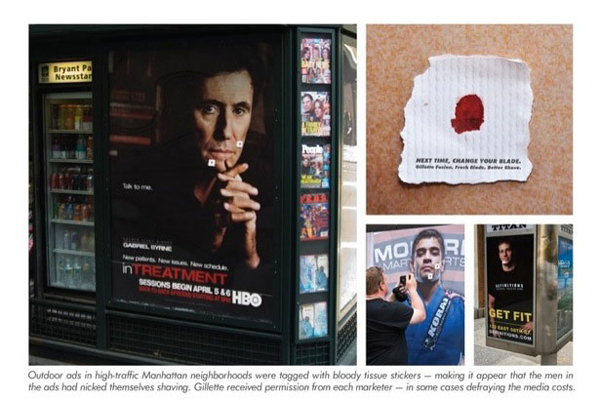 Below are some great examples of companies who used pre-existing, out of the ordinary space and decals to create ads that made a connection and had a lasting impact with consumers. These ads had a novelty factor and amused the audiences which is memorable and share-able, exactly the desired outcome for increasing brand awareness. 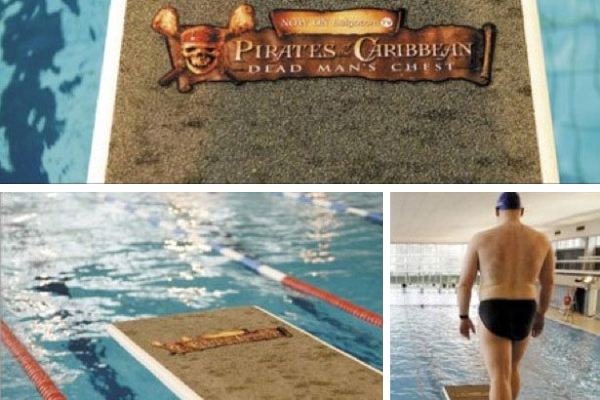 To advertise the upcoming film, Pirates of the Carribean: Dead Man's Chest, waterproof decals were placed on diving boards at public swimming pools. Pedigree used street decals outside pet stores designed like bowls of dog food. 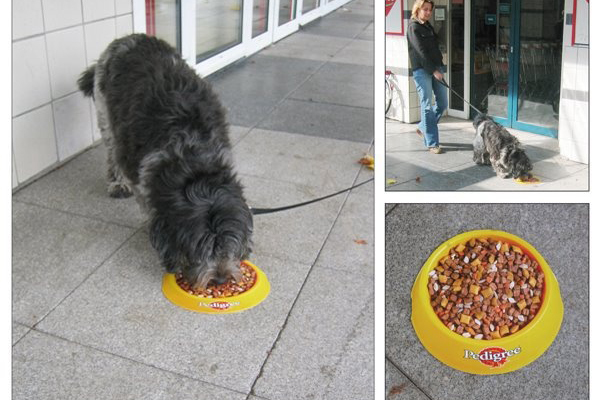 To take it one step further, Pedigree added a meat scent to each sticker so dogs would stop and sniff the bowls, which added to the visual effect and created interaction with the consumers. 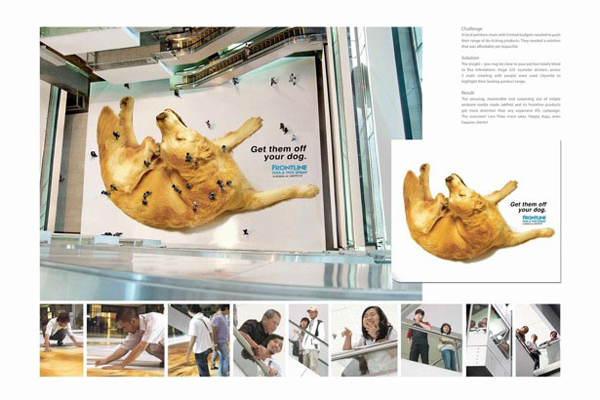 Similarly, Frontline Flea and Tick spray laid out a large floor decal in a busy shopping center. From the ground it doesn't look like much, but from above, it creates the illusion of a dog with moving fleas and ticks (which are actually shoppers). Gillete Men's Razors engaged in an advertising campaign which made use of other advertisements within the city of Manhattan. Bloody tissue stickers were added to billboards, bus stop posters, and store front windows with images of men's faces. 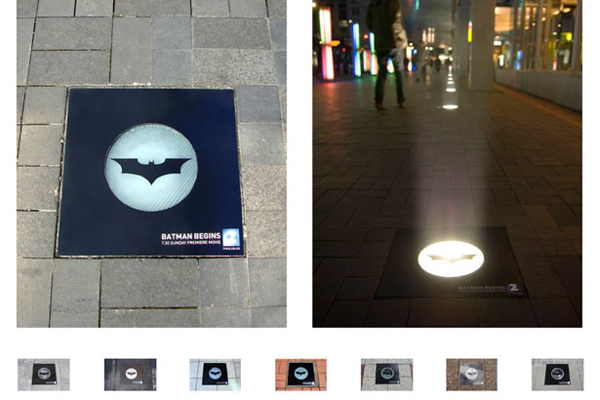 The premier of Batman returns was advertised by turning local street lighting into the infamous bat signal, used throughout the franchise. If you have an idea and aren't quite sure which material would work best, we can help. Our staff will be happy to create any large format decal or stickers for your advertising campaign. You can get in touch with us by filling out the custom quote form.